Happy Quilting: Kings Crossing - A Finish and Tutorial!! Today I am super excited to share with you a new quilt finish along with a tutorial for it!!!!! This is Kings Crossing and I have to say, I love it!!! A little while back I was asked by the wonderful folks at Ink and Arrow Fabrics if I would like to make a quilt with some of there beautiful fabrics. I instantly fell in love the little Pixies. They are the perfect little blender dotish, They are actually kind of like a dot that has been squared off on the ends, so cute :) And I just knew with all those adorable squarish dots that I had to some fun interlocking geometric design to really show them off. After a little bit of playing around with some sketches, I came up with this design. And wha-la, Kings Crossing!! I had so much fun making up this quilt. It really goes together quick because it is made with a whole lot of strip piecing!!! And who doesn't love a speedy bonus ;) And I just love all of the wonderful movement this quilt has, the interlocking block design just keeps your eyes dancing around the quilt!! And while I was having so much fun making this quilt up, I took some pictures along the way so I could share it with all of you!!!! So . 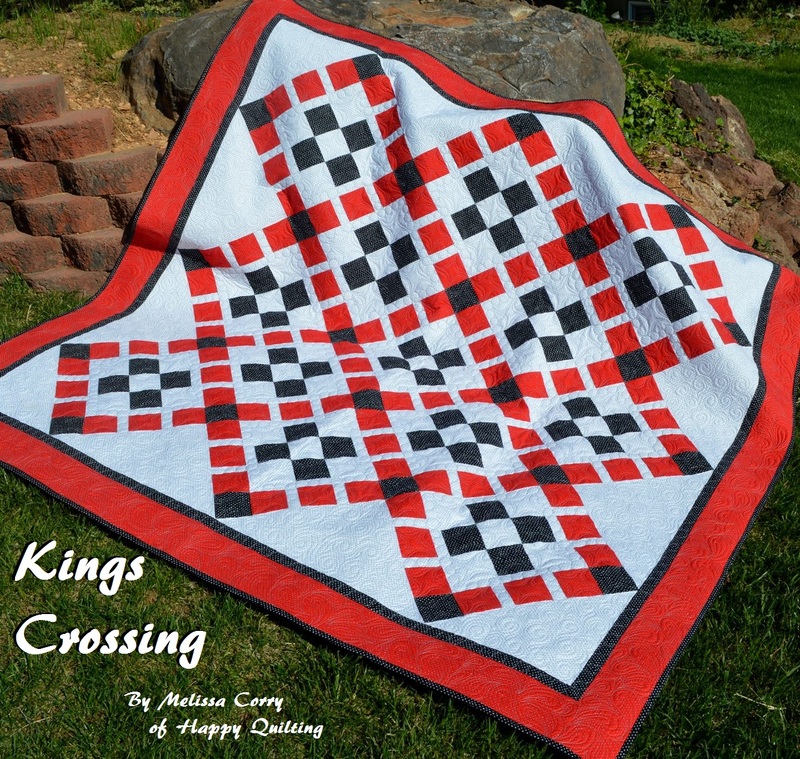 . . Let's get to the tutorial for making your own Kings Crossing Quilt!!! Got all your fabrics . . . Let's get started!! Be sure and press all of your yardage before cutting. That is a huge help in accuracy. Sub-cut the (2) 13" x 13" squares in half diagonally once. This will leave you with 4 small corner setting triangles. And now the cutting is done and you are ready to start piecing. Now, we are going to take the 6 strip sets from the previous step and sew them together in sets of 2 too make 3 strip sets. Place two of your sew strip sets with right sides together aligning the red and white strips again. Chain stitch a 1/4" seam along the edge to strip piece 3 sets. Clip the threads between the strip sets. And finally, grab the remaining (3) 3 1/2" x WOF red strips. Place the red strip along the white strip with right sides together. Chain stitch a 1/4" seam along the edge to strip piece 3 sets total. You will have 3 strip sets now that each have 3 red strips and 2 white strips between the reds ;) Clip the threads between the strip set and set them aside for the moment. And now, more strip piecing. Place a 3 1/2" x WOF black strip onto a 3 1/2" x WOF white strip. Once again, stitch a 1/4" seam along the edge aligning as you go. Chain stitch 3 sets total. Clip the threads between the strip sets. Now, place a 3 1/2" x WOF White strip onto the pieced black strip and stitch a 1/4" seam along the edge aligning as you go. Chain stitch 2 sets total. Clip the threads between the two strip sets. And finally, grab the remaining pieced strip and a 3 1/2" x WOF Black strip and align the black strip along the pieced white strip. Stitch a 1/4" seam along the edge aligning as you go. You only need to make the one strip set in this layout. And now, move on over to your ironing board. Press the seams of all your strip piecing towards the dark fabric. So in the case of the red/white strip sets, press towards the red and in the case of the black/white strip sets, press towards the black. Place your red/white strip piecing strip onto your cutting mat folded in half and aligning the top of the strip with a horizontal line on your mat. (stack your 3 strip sets if you like ;) Using a vertical line on your cutting mat as a guide, cut a straight edge. (notice, you need 42" of usable fabric, so cut the straight edge close to the edge of the selvage.) Measure in 3 1/2" inches and sub-cut your strip making a 3 1/2" x 11 1/2" strip set. Continue in this fashion measuring and cutting 6 times which will result in 12 strip set units. If you stacked your strip piecing you are done, if not, go ahead and sub-cut the other two red/white strip sets so you have a total of 36 red/white strip set units. And now onto our black/white strip sets. Place your black/white strip piecing strip onto your cutting mat folded in half and aligning the top of the strip with a horizontal line on your mat. (again, stack your strip sets if you like) Using a vertical line on your cutting mat as a guide, cut a straight edge. (and again, keep the straight edge close to the edge of the selvage.) Measure in 3 1/2" inches and sub-cut your strip making a 3 1/2" x 9 1/2" strip set red/white units. Continue in this fashion measuring and cutting 6 times which will result in 12 strip set units. If you stacked your strip piecing you are done, if not, go ahead and sub-cut the other two black/white strip sets so in the end you have a total of 24 white/black/white strip set units and 12 black/white/black strip set units. And we need 3 more strip sets but we are just going to piece them as I didn't want to waste the rest of a strip set. So layout (5) 3 1/2" x 3 1/2" white squares and (4) 3 1/2" x 3 1/2" black squares as show below. Place these with your other black/white strip sets. You should now have 26 white/black/white strip set units and 13 black/white/black strip set units. And with all of the strip piecing done, you are ready to start making blocks!!! We are going to be making 9 patch blocks. Place a white/black/white strip set unit onto a black/white/black strip set unit with right sides together. You can pin the seams or simply nest/lock them as you sew. Stitch a 1/4" seam along the edge. Chain stitch 13 sets like this and then clip your threads. Now, to finish the 9 patch, place a white/black/white strip set unit onto the raw edge of your black/white/black pieced unit. Pin or nest the seams as you go. Stitch a 1/4" seam along the edge and continue chain stitching all 13 sets. Clip your threads between blocks and press the seam allowances open or to one side, depending on personal preference. And now, we are going to add a little white border to the 9 patch blocks. Place a 1 1 /2" x 9 1/2" rectangle on the top of a 9 patch block with right sides together. Stitch a 1/4" seam along the edge. Chain stitch all 13 blocks like this and then clip your threads. Now, repeat the same process, only chain stitch a 1 1/2"x 9 1/2" rectangle to the bottom of all 13 blocks. Clip the threads between the blocks and press the seam allowances outwards. And now, onto the sides. Place a 1 1 /2" x 1 1/2" rectangle on the left side a 9 patch block with right sides together. Stitch a 1/4" seam along the edge. Chain stitch all 13 blocks like this and then clip your threads. Now, repeat the same process, only chain stitch a 1 1/2"x 11 1/2" rectangle to the right hand side of all 13 blocks. Clip the threads between the blocks and press the seam allowances outwards. And now you should have 13 Bordered Nine Patch blocks that each will measure 11 1/2" x 11 1/2" and you are ready to start putting your quilt top together. Layout your Bordered Nine Patch Blocks, Strip Set Red/White units, remaining 3 1/2" x 3 1/2" black squares, Side Setting triangles, and Corner Setting triangles as shown below. To start, in the skinny sashing strip rows, place your cornerstones onto the red/white sashing strips with right sides together. In the block rows, place your red/white stashing strip onto the blocks with right sides together. Sew a 1/4" seam along all the edges. I like to stack everything up and take it to my sewing machine so that once again, I can chain stitch all of these and save time and thread. Clip your threads and then press the seams of the sashing rows towards the black cornerstones and the seams of the block rows towards the blocks. This avoids the most seams and allows everything to lie nice and flat. Now, you can start to sew your rows together. Place the second block in the row onto the first with right sides together as shown in row 2. Align and pin the seams. Stitch a 1/4" seam along the edge. Do the same for the skinny sashing row. Then place the third block onto the now sewn together first and second block with right sides together as shown in row 3. Align and pin the seams. Stitch a 1/4" seam along the edge. And again, do the same for the skinny sashing row. Continue in this fashion until all the units in a row are sewn together. Repeat for all rows, both blocks and sashing rows. Once again, press the seams of the sashing rows towards the black cornerstones and the seams of the block rows towards the blocks. Your quilt top should look a little something like this. Now, we need to add the sashing rows to the block rows. Place the sashing rows onto the block rows with right sides together as shown below. Notice the center row will have a sashing row on both the top and bottom of the row. Align and pin the seams. Stitch a 1/4" seam along all the pinned edges. Press the seams open or to the side depending on preference.And now, you are ready to add the setting triangles. Place the setting triangles on the ends of each pieced row with right sides together. Align the Side Setting triangles with the edge of the row and center the Corner Setting triangles. I like to pin them in place, just because it is easy to accidentally have them facing the wrong way if they slide off and get twisted on the way to your machine. Stitch a 1/4" seam along all the pinned edges. Clip your threads and press towards the setting triangles. And now, all that is left is to sew the rows together. I like to start on both ends and work my way inwards. Place and center the Corner Setting Triangles onto the first rows with right sides together. Stitch a 1/4" seam along the edge and press outwards towards the Corner Setting Triangles. And sorry, I somehow, missed taking a picture of adding the next row, but it is the same process. Just place the row moving inwards onto the next row with right sides together. Align and pin the seams. Stitch a 1/4" seam along the pinned edge. I like to press these seams open, but if your prefer, press them to the side. And continue in this fashion until all the rows have been sewn together!!! Now, using your mat, ruler, and rotary cutting, square up your quilt, trimming the slight bit of excess setting triangle 1/4" away from the the points of the cornerstones. And now, you just have to add the borders!!! Grab your (7) 1 1/2"x 42" black strips and sew them together end to end to make one giant long strip. Do the same for your (7) 4 1/2" x 42" red strips. Press the seam allowances to one side of both the black and red strips. We will start with the black border. Place the black strip onto the top of the quilt top with right sides together. Stitch a 1/4" seam along the edge, aligning as you go. When you get to the edge of the quilt top, trim the strip even with it. Repeat this process for the bottom of the quilt top. Press the seams outwards towards the black strip. And now add the two side borders in the same fashion. Place the strip onto the left hand side of the quilt with right sides together and stitch a 1/4" seam along the edge aligning as you go. Clip the strip at the edge of the quilt top. Repeat for the left hand side of the quilt and press the seams outwards towards the black strip. Now repeat the exact same process for the red border strip, adding it to the top and bottom of the quilt first and then pressing. And then adding it to the two sides and pressing. And your beautiful 72" x 72" quilt top is done!!!! Isn't it just so fun!!! I had a lot of fun quilting mine with some custom quilting of double swayed arches, pebbles, swirls, and paisleys. I will say, I wish I would have used white thread on the white background, but I was trying to pick a nuetral color grey that would work on the red, black, and white. Ah well, live and learn ;) But I sure do love all of that fun quilting ;) And you have to love all of the yummy texture it creates. Use the remaining (8) 2 1/2"x 42" black strips for binding the quilt. And now, just sit back and enjoy your beautiful Kings Crossing Quilt!!! It really is the perfect size (72" square) to take on a picnic and enjoy the summer sun!! And that's all for today!!! I hope you all have a super Happy Quilting Weekend!!! Excellent directions!!! Terrific pictures too. Very nice! Thanks for the in-depth tutorial - it's very helpful! Thank you for the detailed tutorial. This is going on my to-do list. thank you for the another great tutorial!! Kings Crossing is the perfect name! The design brings to my mind the London Railway station. And your quilting is gorgeous Melissa! Thank you for the tutorial. Great quilt. I love the contrast of the Red Black and white. Your Alma mater is Lucky! I will look for it in SLC for sure. That's beautiful! Thank you for the tutorial. Always some great tips! Que facíl parece, de lo bien que lo has explicado, muchas gracias por tú tiempo. That looks wonderful. Thanks for the tutorial. Very cute, thank you for the tutorial! Excellent tutorial. You are making my "To Do" list grow longer. I really wish quilters would learn to use .pdf downloads, or provide links to Print Friendly! I like many of the pattern I see, but I do not want to use paper and ink to print them when it's more ecologically sound to use electronic downloads and storage. Love this design and it looks so easy. Thankful you showed the close ups of the material. I thought it was just solid colors. Those dots make the quilt. Thank you so much for such a good tutorial. Outstanding, perfect for my son's birthday. If I get started now I should be able to have it done. Another gorgeous pattern to make me happy. Thank you. Just when I think I have every pattern you've designed I find another one! King's Crossing is stunning and It will go in my Melissa notebook. I, too, would love pdf files; however with the detail you put into your tutorials I can certainly understand. You are probably the premier tutorial writer in the quilting world and please know it is very much appreciated.